Lever Switches appear multiple times throughout the Mario franchise. They are oftentimes used to trigger special events or occurrences when pulled, pushed, or simply hit. 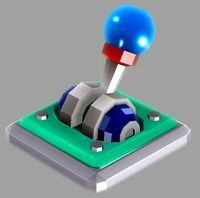 A Lever Switch as it appears in Super Mario Galaxy. In Super Mario Galaxy, Mario can activate Lever Switches by spinning them. Lever Switches can have a variety of different effects, obviously depending on their location in the level, etc. Their functions can range anywhere from turning on lights in dark areas to causing entire platforms to move forward or backward. Lever Switches in Super Mario Galaxy 2 serve exactly the same purpose as in its predecessor, the only difference being that Yoshi now has the ability to activate levers through the use of his extremely long tongue, as opposed to Mario just spinning them. In addition to this, a second player can also use the Co-Star Luma to spin levers and activate them as well, thereby eliminating the need for Mario to come in direct contact with the lever in order to activate it. Lever Switches reappear in Super Mario Odyssey, where they serve the same purpose as in Super Mario Galaxy 2. They can be activated by throwing Cappy at them. This page was last edited on November 21, 2018, at 23:53.